Oisin O’Rourke and Sean Moran scored five points apiece for the visitors in Thurles. 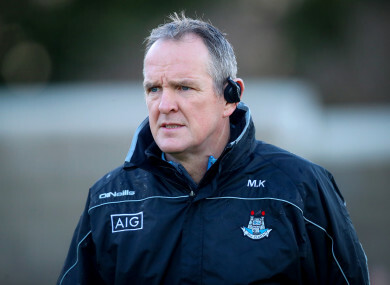 Dublin hurling boss Mattie Kenny has guided to his side back to the league semi-finals. MATTIE KENNY HAS steered Dublin into a league semi-final in his first season in charge as they did enough to dismiss Tipperary in their own backyard in Thurles. Dublin were good value for their victory and maintained their composure but Tipperary will rue 18 wides. Dublin never trailed in the match and shot just half a dozen wides to advance to the last four. Dublin led by 1-10 to 0-9 having played with the breeze in the opening half but Tipperary were guilty of some wayward shooting, hitting nine wides to three. The game struggled to come to life on a heavy pitch but Dublin made the better start and were good value for their 1-4 to 0-2 lead after 10 minutes. The goal came from Fergal Whitely when he whipped it home from close range after a shot from Oisin O’Rourke was smothered by the home defence. Jake Morris and John McGrath got the early scores for Tipperary after O’Rourke landed two early frees for Dublin and he landed a fine effort from play after full-back Eoghan O’Donnell delivered a long-range score. But Dublin did not push on from that bright start, with points from Chris Crummy and Sean Moran cancelled by Jason Forde and Noel McGrath. Jake Malone made it 1-7 to 0-4 to Dublin after 24 minutes before Tipperary finally got their radar sorted with Niall O’Meara, Forde and Seamus Callanan scoring good points. Eamon Dillon and Rian McBride hit good efforts for Dublin but Morris responded for the hosts. Moran, one of three Dublin backs to score in the opening half, converted a free from 90 metres but Tipperary midfielder Michael Breen had the final say of the half with a fine point to leave four between at the interval. It took Tipperary just four minutes to wipe out the Dublin advantage as Forde hit two frees and Morris and Noel McGrath were on target to level the sides at 0-13 to 1-10. Moran and Dillon hit back with points for Dublin but Forde cancelled these at the other end with a brace of frees. The crowd of 3,503 gave Brendan Maher a huge reception as he came on for his first action since suffering a cruciate injury in last summer’s championship. But it was Dublin who seized the initiative with Cian Boland shooting two good points and another free from O’Rourke put them 1-15 to 0-15 in front going into the final quarter. The introduction of Mark Kehoe added sharpness to the Tipperary attack and a couple of points from one of the heroes of their All-Ireland U21 title last year got them back in contention before Forde levelled the match eight minutes from time. Moran’s fourth point of the game edged Dublin back in front and Dillon and Paul Ryan also found the range but Tipp kept in touch through Callanan and Noel McGrath. Dublin lost Danny Sutcliffe to a second yellow card in the dying moments but another point from Ryan was enough to see them home, although a late point from Brendan Maher ensured a nervous finish. Scorers for Dublin: Oisin O’Rourke 0-5 (0-4f), Sean Moran 0-5 (0-3f, 0-1 ’65), Fergal Whitely 1-0, Eamon Dillon 0-3, Cian Boland 0-2, Paul Ryan 0-2, Eoghan O’Donnell 0-1, Rian McBridge 0-1, Jake Malone 0-1, Chris Crummy 0-1. Scorers for Tipperary: Jason Forde 0-7 (0-6f), Noel McGrath 0-3, Jake Morris 0-3, Michael Breen 0-2 (0-1f), Seamus Callanan 0-2 (0-1f), Mark Kehoe 0-2, John McGrath 0-1, Ronan Maher 0-1, Brendan Maher 0-1 (0-1f), Niall O’Meara 0-1. 19. Alan Flynn (Kiladangan) for Breen (61). 19. David Treacy (Cuala) for O’Rourke (69).